Playoff Pool Chutes And Ladders: Get The F Out Of Here! Henrik Lundqvist said it best last night to the referee. Seriously, another week has gone by for those fantasy poolies and Round 2 will start by week’s end. As the second season continues ladies and gentlemen, playoff pools are becoming more popular than ever. So what are we going to do? Honestly it is time to give you “The Good, The Bad, And The Ugly”. Somewhere Clint Eastwood may sue us for royalties. Giroux started off a little slow but then burst apart the world with a six point Game 2 performance against the Pittsburgh Penguins (3 goals, 3 assists). 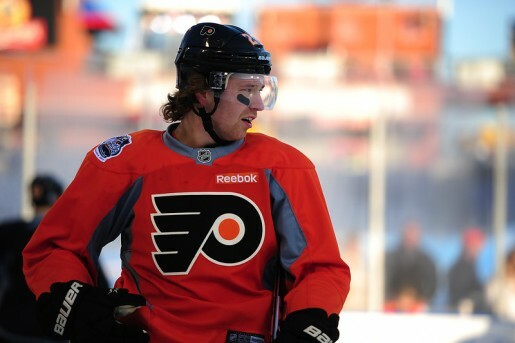 Overall, Giroux had 6 goals and eight assists in the six games against Pittsburgh. Giroux with the help of Jaromir Jagr and company has played far more disciplined than Sidney Crosby and company. Giroux is a major reason why as his leadership and production have rubbed off and also why the Philadelphia Flyers moved on to the second round. Setting a tone is one thing, then going out and scorching the postseason offensively is another. Can he continue this in the second round? Honestly does that matter right now would be the better question. When a goalie literally stands on his head like Smith did tonight against Chicago, what else is there left to say? Smith kept his team in the game when it had no business being in it last night then had to smile as Phoenix poured it on in the third period. There was one reason why I thought the Coyotes might win this series and that was Mr. Smith. The 4-0, 39 save shutout was a mere exclamation point in a series where Smith was just better than even the best Chicago had to offer. He was the best player on the ice and his numbers pointed that out. The 4-2 record is of course the bottom fantasy line for poolies as the other stats are just a bonus. Sure Jared Stoll eliminated the Vancouver Canucks but it was Quick who was the main reason behind the Los Angeles Kings advancing to Round 2. Simply the goalie from Milford, Connecticut was solid all around in the five game series and the reality was not even Cory Schneider could save Vancouver from its fate. Roberto Luongo was just not all there early in the series and that besides the Daniel Sedin injury allowed Jonathan Quick to really shine. The Kings are onward to face the St. Louis Blues and who knows what may happen there. Quick’s 1.59 GAA may be a hair better than Smith’s 1.81 GAA but both goalies certainly exceeded anything expected of them in Round 1 along with their .950+ save percentages. There were surprisingly a bigger segment of the population that picked the Phoenix Coyotes and the main reason why was goaltending. Granted, Chicago had more firepower going into this battle but when your netminder constantly gives up goals on shots that can be stopped, there is a problem. It is not like Crawford was bad on the level of Marc-Andre Fleury but the malaise was bad enough to drive Crawford owners crazy. They will not have to worry anymore as Chicago was eliminated in Game 6 last night by a score of 4-0. Crawford’s save percentage was .800 by the way (16 saves on 20 shots) and he did not make too many of those above average saves needed to win a series. It was one that is hard to believe but fantasy ugly does not go to the Vancouver Canucks but the Penguins won this one again more for how badly they played Game 6 than the fact that they won Games 4 and 5 in the last week. That was just the problem. People knew that the Canucks were still bad and just not scoring at all. Pittsburgh teased people with a ten goal outburst in Game 4 and even a narrow win in Game 5. However, the old Penguins came back in a Game 6 revival that had many downturns. The 5-1 mauling by the Philadelphia Flyers included bad team play in all three phases and a Coach who clearly looked bewildered by his team’s performance. Pittsburgh was conned into play Philadelphia’s game. They fell for the rope-a-dope and it was ugly! Now that we have dusted the top players off a bit or the upper echelon, it is time to get a little gritty and keep tabs on the not so heralded guys on a fantasy pool roster. There are players on second, third, and even fourth lines that you can find that will help supplement your pools. Sure these are high risk but think of the potential “eye on the prize” mentality. This is a simple list of players that one has to keep an eye on at the very least. It is put up or shut up time for the Captain who expects to be a UFA come July 1st and be available to potentially the highest bidder. In the meantime, he could boost his value by actually showing up in these playoffs a bit more. The same goes to Ilya Kovalchuk in case anyone is wondering. For whatever reason, these two have not clicked like they did in the regular season. Three points in five games does not sound bad for each but when you are the leader, expectations are higher. If Parise and company do not find a way to get it done in Game 6, the Forward will be that much closer to a new destination for the 2012-13 NHL season. Boyle is the type of player that drives opposition nuts but has some deceptively pretty good hands. Combine that with a 6 foot 7 frame and you have a guy that can do some damage come playoff time. Sure enough, he has three goals for the Rangers. For those who thought maybe we should include Danny Briere on this list, Boyle was a better choice because Briere is too much of a proven commodity come playoff time. His concussion at the hands of Chris Neil definitely leaves a void even though the Rangers did force a Game 7 last night. If there is a guy who needs to start playing like a little human wrecking ball, its Brad Marchand. Being a traditionalist, Pat Verbeek was always “the little ball of hate”. However Marchand has taken that nickname. Unfortunately the scoring in the playoffs has not come with the territory. With a Game 7 coming up, Boston needs a hero and it may have to be a dirty, gritty player like Marchand to save the day. The Blues may not always score a ton but McDonald just adds something so undeniable. He is a pivot who can make an entire line and power play unit that much better. His only question has been health and that injury history really is well documented. However, his potential production is just too good to pass up as the other more well known names are gobbled up in pools. One could do much worse. The eight points in five games proves our hypothesis and as the rounds go by, McDonald is just going to become that much more essential in pools if you snatched him. This is straight from the lists at TSN. We will try to translate when needed. The quick translation for playoff poolies is as follows. Jaroslav Halak is out until at least Game 3 of the second round against LA with a groin/leg injury and honestly it may just be longer. Now Brian Boyle still has a slight chance of playing Thursday against Ottawa in a Game 7 but a concussion is too much of a risk. Remember Daniel Alfredsson missed three games so keep that in mind. That is it for now. Good luck in your fantasy playoff pools and thanks for reading.